Hello everyone! Thanks for all the sweet comments on my love story yesterday. I promise you'll hear the rest of the story later on! It would take until later in March before we finally became a couple, so you'll have to wait like I did when I was a teenager! Today I wanted to share two outfits. 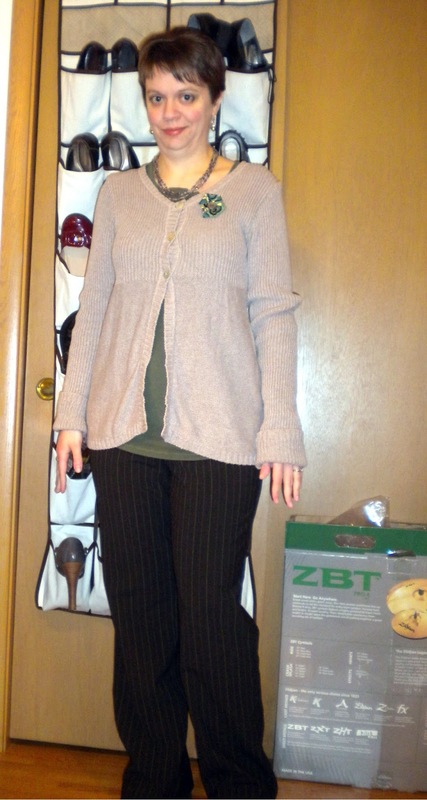 First up is what I wore to my Valentine's dinner with Mr. Monkey. We had decided to skip the crowds on actual Valentine's Day and have a nice dinner out this past Sunday instead. 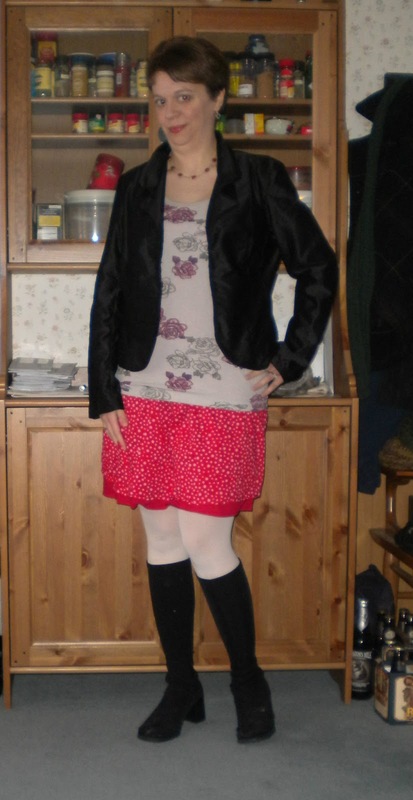 I still dressed in a Valentine type theme though! I pulled my favorite red sundress out of summer storage and attempted to winter it up a bit. I like the result, kind of sassy and fun. We went to a newer Italian restaurant (Louis Ristorante, attached to Cossettas in St. Paul for you locals) and had a really nice, though somewhat spendy meal. We figure we only do a big meal out like this a couple of times a year, so we deserve a treat every now and then. We had fantastic red wine, Caesar salad, veal chop and some sort of pasta with Italian sausage in a thin wine type sauce. Delicious. Today it was crazy cold once again, which ok, I know, it's Minnesota, what do I expect? But man, we have had a lot more cold, windchill type weather this winter than we had last year for sure. So anyway, I had to do layers today. Added a touch of flair to my sweater with my newest Megan Mae buttonflower. I realized later I should have done a close up. I will next time! Can you guys believe that February is more than halfway through already? This means spring has to be around the corner though right? Both outfits are great. I love your date night look with the pop of red! And Italian food...yummy! We skipped the crowds and did Valentine's day over the weekend too. Your V Day dinner sounds delicious! We had such a mild winter last year that this one seems pretty brutal in comparison. I can't wait till it's March! A sundress in Winter! I like your spirit! And red always pops. I love the sundress winterized. It's a great pop of color. I have some serious spring fever. It's sunny and fairly warm one day and then snow the next. your valentine's dinner sounds lovely!!! And I love that you dressed up a sundress! It looks so lovely especially paired with those boots! Both of these looks are fantastic! I love the idea of going out on another night, Kyle and I never did, but, I will remember that for next year! I commend you on winterizing a summer dress, more people should do it! i know...next friday is march, so crazy! your date sounds fun. i have never been there, but it sounds loveley!! Love the pop of brightness with the sundress. And the buttonflower looks totally cute on your sweater! I can't handle the cold, thankfully it does look like spring is on its way. Hopefully sooner rather than later. I love both outfits! I really need to figure out how to wear my maxi and or sun dresses during the winter. I love your Valentine's Date outfit! 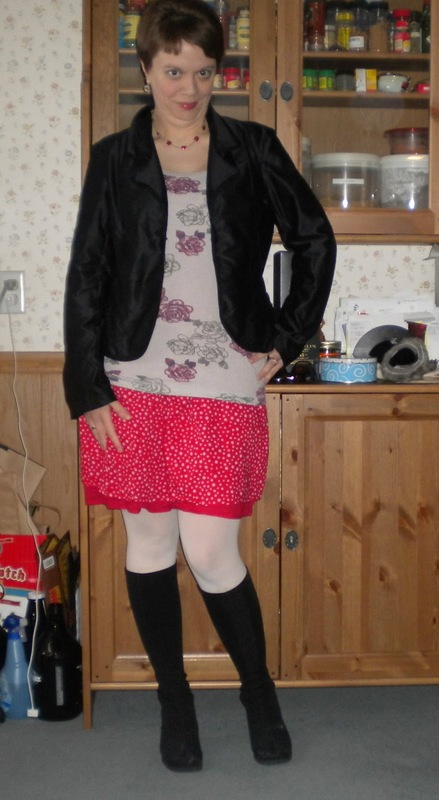 What cute colors and I like how you pared the black blazer and boots. The food sounds delicious too! Love your cardi in the second outfit! Bethie! Thanks for your fun comments to me today. I love that red skirt. So darling. Oh I could go out to Macaroni Grill every night. I was so delicious and fun! Yay! Have a super evening and day tomorrow, okay? I like your Valentine skirt, and I need to try out Louis Ristorante sometime. Cosetta's is good, so I figure the new one must be good too. I love that pin in your second look! I don't use pins nearly enough! I like your date night dress! I must winterize a summer dress I have, thanks for the inspiration.